The scars of physical and emotional child abuse were always etched on Michael Jackson’s countenance, long before he deconstructed his face to mask it. It is one of the great feats, this incredibly talented prodigy — exploited, beaten, and robbed of precious childhood innocence and the foundation of self esteem by those who claimed to love and protect him — becoming one of the most influential and dominant forces in American pop culture. It is a wonder the man the papers continue to flippantly call Jacko didn’t end up balled in a fetal position, sucking his thumb and babbling nursery rhymes. And maybe he did; holed up in his many bunkers from the Neverland Ranch to secret compounds and hotel suites from London to Nigeria. But that was long after he had overcome being reared by a twisted gargoyle of a father and his enabling matron, and bearing the pressures of carrying his fairly competent musical siblings, who relied heavily on his startlingly gifted talents and incandescent star quality to even get a sniff of life outside of Gary, Indiana. From the start, Michael Jackson was the bread-winning, bacon-hauling strength and breath of the Jackson Five — those sparkling eyes, blinding smile, and a playfully endearing personality far beyond his eleven years. And although anyone who came close enough to this phenom clung hard to his hem at every turn, it was the young Jackson’s ability to focus on the blessed music that allowed him to not only endure, but thrive. It’s curing melodies and furious rhythms, the highs and lows of its keys and its soothing structure of scales, arrangements and the flawless dance steps of campy routines that accompanied it all. Jackson’s juvenile voice — the one that predated the falsetto yipping adult screech version — barely trained, raw, and preternaturally distinctive was one hell of an instrument. What he’s doing in “I Want You Back”, “Got To Be There”, and “Never Can Say Goodbye” is downright eerie. He alone created the Jackson myth: A bottomless well of magically imbued DNA, when all along it was little Michael and a bunch of hanger’s on. You think a moderate talent like Janet Jackson would have been outfitted with a Jimmy Jam/Terry Lewis School of Funk tutoring if her name had been Jones and her brother wasn’t the biggest pop star on planet earth? This was a being literally created to entertain, so much so that all of the lunacy that became his personal life was just a way for him to keep up the performance, maintain the “put on”. The Show was his safe place, like his arrested development, a state of naive inertia, caught between a clamoring for the affection of millions and the abject horror that they would eventually uncover his demons. Hey, but child stars, whether mediocre ones like Danny Bonaduce or legends like Shirley Temple all have their tales of woe. It’s as old as traveling carnival freaks and pathetic dog acts; cute kids who can carry a tune and hoof a number to pay daddy’s bills. 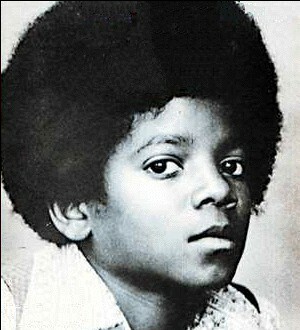 But it was far more than that for Michael Jackson, who was almost immediately emasculated by his family and driven hard by the factory corral at Motown, both of which conspired to tell the world that the already amazing whiz kid was three years younger at a time when a pre-teen boy is eager to add a half-year on every turn of the calendar, to inch closer to his more mature and handsome older brothers who were banging groupies across darkened hotel rooms on endlessly grueling tours. It was a strange confluence of emotions for a boy caught in the spotlight, hobnobbing with glitzy celebrity, handling nagging newsmen and appeasing clamoring fans, trapped in airless studios for weeks and run ragged in rehearsals, while also being healed and exhalted by song. For Michael Jackson, it was more than a love affair with showbiz and the adulation that came with performing; it was a measure of pride and identity. Most of all, it was escape. Escape from the looming prospect of failure in the shadow of an incessant badgering for perfection, all the while being looked upon as nothing more than a cash machine. It is why years later Jackson told gurus and spiritual advisors he wouldn’t dare trade the sacrifices and abuses he endured as an imprisoned child star for a life filled with the peaceful anonymity of uneventful mediocrity. This was a being literally created to entertain, so much so that all of the lunacy that became his personal life was just a way for him to keep up the performance, maintain the “put on”. The Show was his safe place, like his arrested development, a state of naive inertia, caught between a clamoring for the affection of millions and the abject horror that they would eventually uncover his demons. In J.Randy Taraborrelli’s exhaustive 1991 biography, Michael Jackson; The Magic & The Madness there emerges a character that defies all psychological reasoning. It is as though you are peering into not so much an abnormality in the human condition, but one without the proper wiring to cope at all. And this is the nut about all the bizarre and allegedly criminal behavior of the aging and morphing Michael Jackson; he was expected to act as if he were a properly developed and nurtured person, when he was anything but. And maybe you can say as much for his genius, of which there is little doubt — its impact equal to that of any African American artist of the 20th century, and that’s saying something. For genius is defined in Webster’s as a “peculiar, distinctive or identifying character or spirit”, right next to “a personification or embodiment especially of a quality or condition”, which could scarcely better describe Michael Jackson from the tender age of eleven until his final breaths in a lavish Hollywood estate a week ago, with all the good and strange stuff in between. In an interview I conducted for this magazine in March of ’08, Counting Crows front man and prime songwriter, Adam Duritz reminisced about the impact the Jackson Five had on his initial love of music. Turns out the first album Duritz owned, like myself, a seventies kid raised on pop and soul and folk and humming melodies and showstoppers, was the Jackson Five’s fourth studio album, “Maybe Tomorrow”.